​Spot Coloring Effects: Mina Ibrow Henna gives you effective spot coloring results and thus this eyebrow henna dye is one of the best professional products for coloring eyebrows with a tattoo effect. Deposits Only Permanent Colour: Our Mina Ibrow Henna, hennabrow kit gives you much superior result depositing permanent color effects and lasts for a longer time. Effectively Covers Resistant Gray: Mina Ibrow Henna, the henna tint for eyebrows effectively covers gray hairs in the eyebrow without any space, thus giving a thick, deeper gray coverage. Long Lasting Naturally Beautiful Eyebrows: The Mina Ibrow Henna, henna eyebrow kit as compared to other eyebrow pencils has a longer shelf life as well as the coloring effects have a lasting impact, thus giving you more expressive eyebrows. With proper, careful proper application of the eyebrow tinting henna, the color may last as long as 6 weeks on the hairs and 5-21 days on actual skin. No more stress of coloring your eyebrows after every 2-3 days with the Mina Ibrow Henna, henna tint for eyebrows. Get your new bespoke brows for the introductory price of £20 (usually £30) patch test required and we recommend leaving 4-6 weeks of growth before coming to your appointment for maximum results. ​Gel polish applies similar to regular nail polish, but lasts for up to three weeks with no chipping or fading. 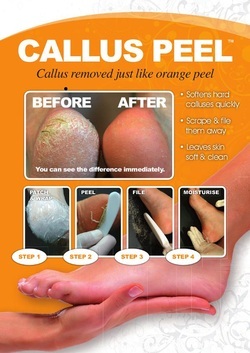 Callus Peel " Callus Removed Just Like Orange Peel"
We recommend a treatment every 2-3 weeks, although results are seen after the first treatment.